An attractive couple is photographed while in the middle of making their dinner. There is a hardbound cookbook on the table beside an uncooked pizza. 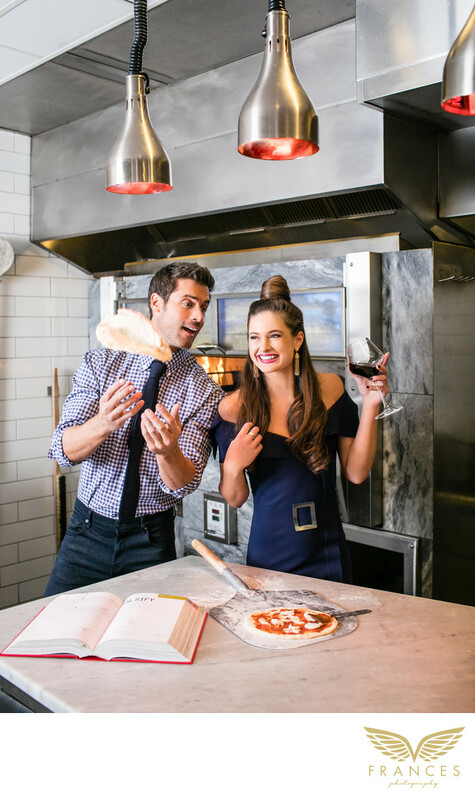 The female model is holding a glass of red wine and laughing, while the male model is in the middle of flipping a pizza crust. He is dressed business casual in a button-down shirt, blue jeans and a dark tie while she is in a formfitting blue dress with a buckle belt design. Her hair is fixed into a tidy chignon on top while the rest of her hair is down in smooth waves. They are in a modern kitchen with white tiled walls, marble countertops and sleek gray light fixtures. Neither of them is looking at the camera so the image appears to be a candid shot, taken while the couple was in the middle of a lighthearted conversation. They look very happy and at ease with each other.